An image from The Big Bounce America Tour's promotional video. 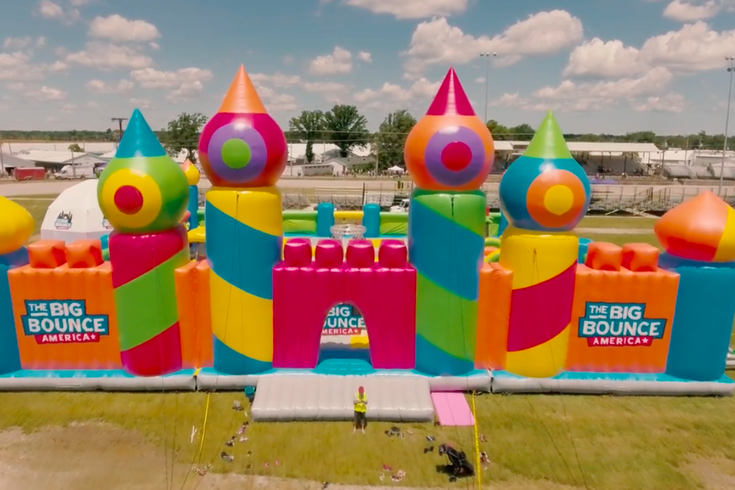 Big Bounce America is bringing "the world's biggest bounce house" to Delaware County for three days this summer. All ages, from toddlers to adults, are invited to jump in the inflatable, 10,000-sq. ft. castle. Inside, there are "zones," each with a different theme or activity. Big kids can practice their slam dunks at the basketball hoops or race in an obstacle course, and little kids can play with inflatable jungle animals or inflatable trucks and boats. At the center, there will be a circular stage, where a DJ will play music and host games and competitions. There are also activities to do outside of the bounce house. Surrounding the castle will be the "bounce village." There will be a gigantic ball pit, a small replica of the castle for the littlest bouncers and another obstacle course with mazes, swinging balls and climbing walls. Big Bounce America will be at Chester Park from Friday, July 6, though Sunday, July 8. Tickets are $17 per person. There are also $11 tickets for the early-morning toddler sessions and $21 tickets for the evening adults-only sessions.